We were asked to make a presentation to the Department of Finance’s ‘Expert Group on Mortgage Arrears’ which is made up of the main interest groups and representative bodies in finance and housing. This firm has long been an advocate of market oriented solutions (short sales, moving paper etc.). However, in Ireland there are several issues. Firstly, short-sales are not possible because of the manner in which recourse to the loan exists, it is on the person and not just the asset, this gives no incentive to lenders to accept a short sale except for people who are already financially strong, our debt laws also work against the borrower. Secondly, as a shareholder in the banks it may not be in the interest of the shareholder (taxpayer) to bail out the individual, personally I don’t want to continue to shoulder costs for anybody, not our banks, borrowers or anybody else, I want taxes to go toward vital services and not much else. Any scheme should be revenue neutral or profitable. That is where the idea of loans to cover a short sale come in. We posted the concept before back in April and Economist Iain Nash did trojan work to put together a report on the workings of a scheme. We used data from the ESRI, Financial Regulator/Central Bank and tried to create a ‘real life’ costing of a scheme. The fundamental idea is to let people borrow the difference (negative equity) and get out from under the loan, carrying a much smaller debt which is manageable and affects their individual cash flow positively, but there is no free money. The loan is underwritten by tax credits and needs to be paid back eventually. The changes that may be required (and that are not in the paper as we were working to fairly stiff deadline where time was short) would be some kind of loss sharing mechanism that makes it more reasonable and palatable to all of the constituencies involved, namely, tax-payers, state, borrowers, bank and communities. We welcome critique, please feel free to comment/cut apart the idea as you see fit! The full paper is here or click on the image to the left. 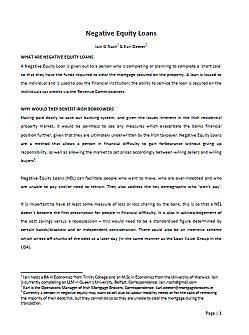 The big problem is that one of the major issues facing people today is not just the affordability on their mortgage but on their short term debt.Negative Equity is only a factor if you try to sell and most people want to stay near “Mammy”. If we were a transient population then we could remove housing lists by opening up Leitrim and Longford to the masses. Paying the mortgage used to be the most important thing on peoples minds, now, they pay the personal loans, credit unions and credit cards because they shout loudest. What we need is a means of amortising these personal debts over a longer period while attached to some security.